Restaurant food at home? Why ever not? Aachari is my favorite restaurant dishes…be it meat, chicken, paneer, or even fish..with gravy or in the tandoor… i just love the blend of aniseeds (saunf) and nigella seeds (kalonji). I usually make my own blend of aachari spice but if you dont have the time or ingredients Shan Achari Masala is your next best bet! 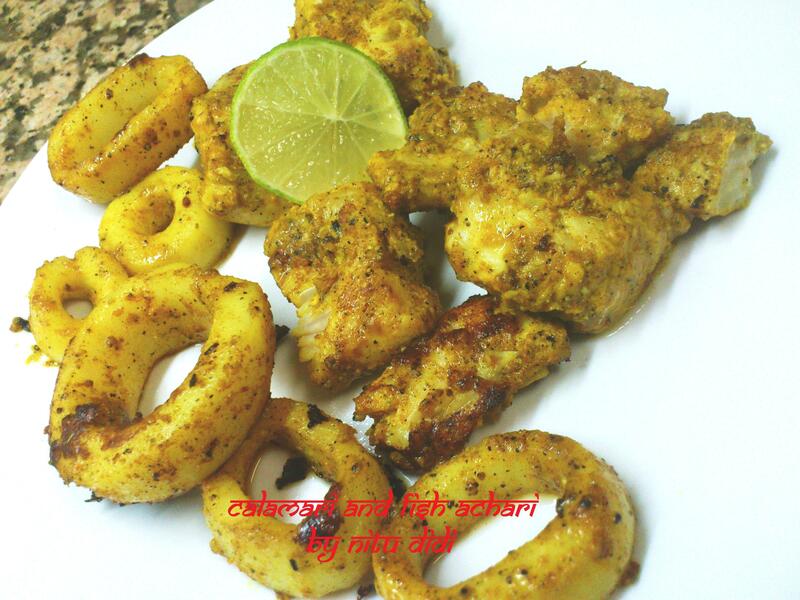 I had a craving for a nice spicy calamari and thought why not combine some fish and calamari in some spicy marinate and make a seafood platter? Well this is exactly what i did. Its important to marinate your calamari overnight for best results. I used catfish for this.. Some information on calamari : here in spain we get baby calamari or calamari rings. I bought calamari rings for this but you can even use baby calamari..you need to have it cleaned first and i will try and explain how. You chop off the head and the eyes and keep the tentacles intact (making it easy for grilling) and then remove the skin from it by scraping it off. You can now cut your baby calamari as you wish or if they are really small keep it whole and marinate it. extra red chilli powder if you like it hot hot hot!! Combine the yogurt with the ginger garlic paste and the aachari spice powder , red chilli powder and the small pinch of salt and lemon juice. Mix it well. I love extra aniseeds and nigella so i lightly pound those and add it to the marinade. 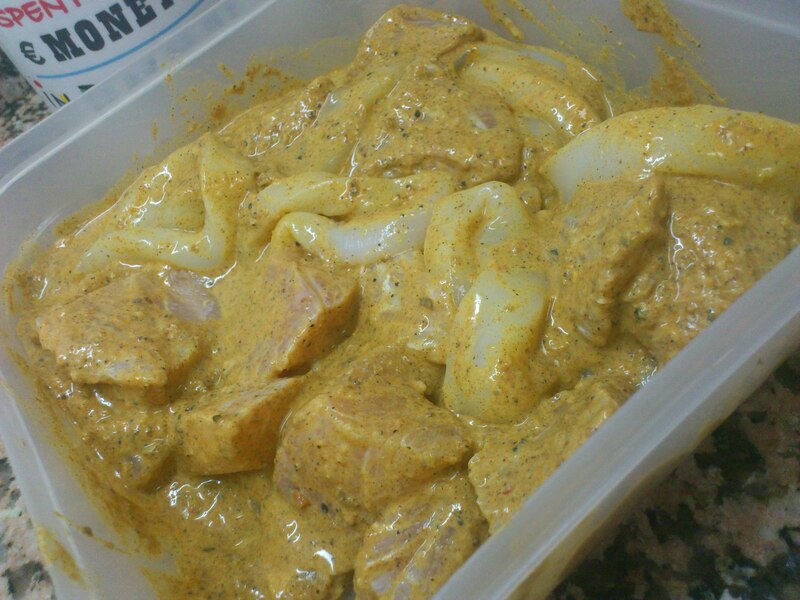 Add the fish and calamari to this mixture and put it in a plastic box , covered and marinate it overnight in the fridge. The next day heat a grill and grill the pieces till done. Serve with a wedge of lemon. Very delicious!!! Which aachari spice powder is best??? Calamari is a good source of protein and very low in fat. This entry was posted in Gluten Free, Healthy Options, Ideas for meals, Indian Restaurant Dishes, Magic Bullet, Something's Fishy and tagged achari, healthy, low calorie, seafood, spicy. Bookmark the permalink.